Stick the pieces of garlic down in to the roast. Turn once or twice gently during the process to ensure even cooking. Remove the liquid stock after 40 mins and allow roast to cool for 20 mins. While its cooling prepare the marinade for the roasting process! Blend all ingredients in a blender till smooth and set aside. Preheat oven to 180’c. Lay baking paper in half of large oven tray and lay roast on it. Paper will keep it separate from roasting veggies. Place garlic halves in the corners around the roast and ensure there is enough paper to pull up around the roast to partially cover. Top roast with chopped garlic, mint and peppercorns and spoon marinade over the top. In the second half of the tray (or a seperate tray if you dont have one big enough), place chopped onions in the base, surround with tomato wedges and add the potatoes on top. Drizzle with olive oil, lemon juice and some salt. Place dish in the oven remembering to spoon the marinade up and over the roast every 20 mins or so for a dense and flavourful exterior. Bake for 1 and 1/2 hours or until the potatoes are golden and roast is dry but caramel in colour. 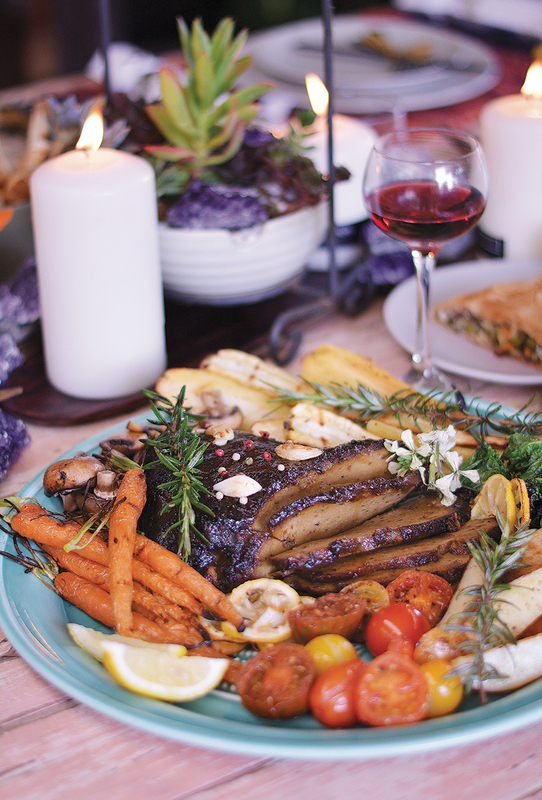 Serve on a platter decorated with roast veggies and homemade gravy. Slice thinly and enjoy. Its great cold too!